Rabbi Shmuel Goldin, religious leader of Englewood’s Ahavath Torah for some 26 years, attributes the synagogue’s growth and longevity to “good fortune, proximity to New York, a lovely area, and a sense of openness” toward people striving to lead Orthodox lives. “A good deal of our character was set by the way it started,” said Goldin. 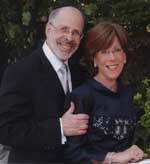 The rabbi, together with his wife, Barbara, will be honored on March 5 and 6 for their years of service to the congregation. The Englewood shul, with more than 700 membership units, includes individuals of all ages, he said, with “a great number of young people and lots of children.” Figuring out how to accommodate and program for all these groups is a challenge. Even in 1983, he said, when he came from Potomac, Md., to lead the Bergen County synagogue, “it was considered a major Orthodox congregation in the New York area.” With roughly 350 family units, the synagogue was then led by noted Rabbi Isaac Swift. Viewing the rabbinate as a “daily adventure,” the rabbi said that each day has presented different challenges. His goals, however, have remained consistent over the years. “My first goal was to be a rabbi to the community, to serve their needs pastorally, to be there and play a role in their lives in whatever way they needed me,” he said. He also strived “to keep the community together and grow it [believing that] it is better to be together under one roof with all our differences and points of views than splinter into small congregations.” Fortunately, he noted, the success of that strategy was enabled by the foresight of the lay leadership, giving the congregation a big enough building to accomplish that goal. While the synagogue hosts numerous minyans, for special occasions – shul dinners, Yom HaShoah commemorations, and the like – congregants “unite for a cause,” said the rabbi. Since he is unable to attend each minyan on a regular basis, he shares this responsibility with the associate rabbi, Chaim Poupko; the rabbinic intern, Aaron Kraft; and the Ahavath Torah scholars, Rabbi Tzvi and Tova Sinensky. The synagogue also employs a yoetzet halakhah, who is available to answer the personal questions of women congregants. “We just hired an administrator,” said Goldin, musing that “it’s a miracle we did so well without one” up to this point. He attributes this success to volunteerism within the community. In addition to adult education programs and scholars-in-residence, Goldin said, he has encouraged the development of groups within the community that study on their own, such as the Isaac Perry Beit Midrash Program. Goldin said he also feels strongly about his members’ connection to Israel and has led more than 15 missions there. His was the first American congregation to visit Israel during the Iraqi Scud attacks, and in 2002 he spearheaded two rallies in Israel, bringing hundreds of people there to express their solidarity. He said he often cites the teaching about the patriarch Abraham, who described himself at the end of his life as a ger v’toshav, both a stranger and a citizen of the world. “This creates a unique dialectic,” said Goldin, recalling that during the height of the war in Kosovo, he traveled with 12 members of the congregation to work with Muslim Albanian refugee children, together with Israeli volunteers. Another of his goals, he said, “is to keep the community abreast of and thinking about critical issues of the day.” He cited, for example, his involvement with NNJKIDS and Jewish Education for Future Generations, which is working to make day-school tuition more affordable for Jewish parents. While it is important to have vibrant programming, said Goldin, the mark of a successful synagogue is “to try to be there each day and each week. The key to our community is being there every day.” The synagogue boasts four morning minyans as well as daily Minhah/Ma’ariv services. Goldin, who has five children and four grandchildren, credits his wife, a speech pathologist, with “playing a tremendous role behind the scenes” and giving him some of his best ideas. “She’s not your typical rebbetzin,” he said. He noted, for example, that it was her idea for him to meet every Friday night with third- to fifth-graders to study the Torah portion of the week. “That way I get to know the kids pre-bar mitzvah,” he said. Goldin, who said he was “gratified” that he could concentrate on writing during his sabbatical in Israel three years ago, has published two books, “Unlocking the Torah Text: Bereishit” and “Unlocking the Torah Text: Shemot.” His third book, on Vayikra, will be out soon. (He will speak about and sign his books at the Kaplen JCC on the Palisades at 8 p.m. on March 3.) He is also pleased that he has been able to get more involved in the Rabbinical Council of America. “It’s good for the community as well,” he said, noting that he is now able to tell congregants about things happening outside the community that he might not otherwise have been aware of. Goldin pointed to the teaching about Mordecai that he was liked by most of his brothers, not all.